Planting the seeds to grow your photo business the right way. Whether you are transitioning from a hobbyist to a professional, or have already launched your new business and don’t know what to do next, this workshop will be a powerful transformation for you. Previously known as the Digital Photography Bootcamp™, Kevin Kubota’s workshop has been one of the longest running and most acclaimed workshops of its kind. GROW Photo Workshops are a fresh approach and the evolution of Bootcamp. It is divided in to two separate workshops, focused on the two phases of most business: the startup and growth phase, and creativity and focus phase for existing businesses that need to reach new heights. Spring 2016 was the Startup & Grow photography workshop. Here you’ll learn the key and essential steps to getting your business going right. Our workshops are commonly called, “trans-formative” because they are powerful beyond the myriad technical and camera skills you'll learn. You’ll learn who you are as a photographer and how to position, brand, and market yourself to the perfect clientele. You’ll learn where to spend your time, and what can be a waste of it. You’ll also connect with mentors and new friends that will become your life-long support team – something impossible to put a value on. View some of the thoughts from past Bootcamp attendees on a recent FB post. The Startup & Grow Photo Workshop is strictly limited to just 10 attendees to ensure individual needs are met and all your questions are answered. We will spend time in our beautiful private classroom as well as outdoors, and on-location photographing. The workshop is hosted at the amazing Five Pine Lodge, a AAA 4-diamond resort that is quiet, luxurious, and the perfect environment for immersion in your craft. Your lead workshop facilitator, Kevin Kubota, has helped to provide thousands of digital photographers the critical skills necessary to make professional digital photography beautiful, profitable, and fun! Kevin has been a Nikon sponsored speaker at major national conventions and conducts workshops worldwide. 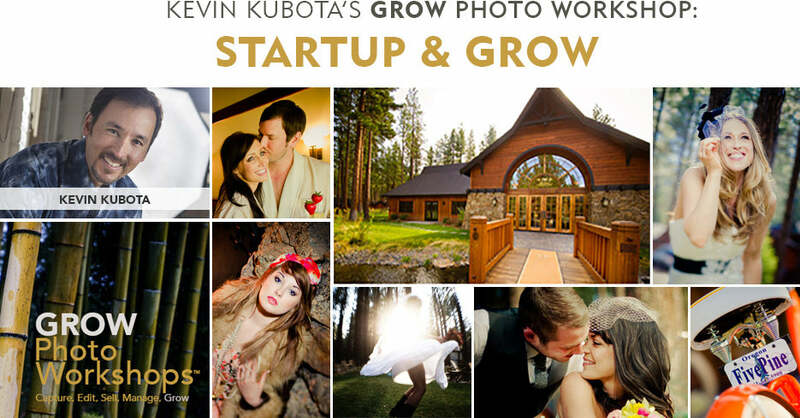 American Photo Magazine named Kevin one of the "Top 10 Wedding Photographers in the World." Kevin has a passion for teaching and is dedicated to "Empowering Photographers." This is your opportunity to learn his secrets of success first hand. Deluxe Accommodations: All-inclusive lodging package with a beautiful, private cabin or lodge room at FivePine Lodge in Sisters, Oregon. All Meals: And they're delicious! Ginsu knives! Just kidding...however, each registrant will receive Kevin's latest Lightroom Workflow Tutorial with arround 100 presets ($99 value). But wait, there's more! You will also receive bonus photo enhancement tools, so you can zip through color correction, sizing, and portrait effects like a true digital photography guru...priceless! Transportation to/from Five Pine Lodge in Sisters, OR and alcoholic beverages. If you are flying, book your travel into Oregon's Roberts Field, Redmond Municipal Airport [RDM] or Portland Airport [PDX]. Redmond is about 20 minutes from the lodge and Portland is about 3 hours. A great attitude and a smile! This workshop will be held at the spectacular FivePine Lodge in Sisters, Oregon; the perfect setting for education, inspiration, and relaxation. FivePine Lodge is nestled in a Central Oregon outdoor wonderland. All rooms are contemporary cabins or lodge rooms nestled in a pine forested meadow at the base of the Three Sisters mountains. Each room provides serenity and privacy, creating an ideal setting for quiet contemplation. In between sessions, you can explore the beautiful outdoors, or stay healthy by using the state of the art equipment at the Sisters Athletic Club. After hours, unwind at the Three Creeks Brew Pub or rejuvenate with a spa treatment at Shibui, the gorgeous on-site spa. In order to give you the most training for your dollar, we strictly limit the number of participants to 10 people. We do this to assure that you will receive all the individual attention you deserve. However, we do welcome family and friends to travel with you, and they are welcome to stay in your room at no additional occupancy charge! For meals, simply sign your guests up for the awesome meal plan upon check-in at the lodge. Alyssa Flaten's audio testimonial - Your browser does not support the audio element. "I learned more about photography techniques, processing, the business end, and marketing in one week than I had ever learned. I also learned about how important getting to know your subjects and telling their stories are to improving my skills. The total immersion, small group setting, and the personal attention makes this experience priceless and unforgettable. I look forward to making my photography sing! " "Bootcamp was a fantastic experience! I started implementing what I learned the day I got home (the workflow system; practicing some lighting techniques and working on my website and brand). I can't wait to see how my business grows and changes in the next several months because of all the useful information Kevin provided. If that was not enough....Kevin and his wife, Clare, also provided us with the most beautiful setting and accommodations in Sisters, Oregon. It was the perfect place to relax, learn, and grow as a photographer. Most of all, they brought their warmth, humor and positive energy to what became an unforgettable experience..."
"If you're looking for an all inclusive photography bootcamp that touches on the various aspects of photography, look no further; Kubota Bootcamp has it dialed in. Instilling confidence in one's spirit to embark on your next photographic endeavor no matter what stage of growth you're in, from lighting, file management and/or the latest industry trends. Kevin and Clare Kubota create a fun nurturing environment with memorable touches that inspire." "This was one of the most amazing experiences I have ever had. Intense, informative, to the point, and lots of fun. I'll be back in a few years for a refresher/checkin....and because Kevin and his beautiful wife, Clare, have an infectious joyful attitude on life & photography." "Kevin creates a safe, open, creative environment for photographers to explore new equipment, new ideas, share experiences, and help each other grow. His energy, patience, and heart are like a shot of adrenaline to the creative mind. I wish I'd gone through his Photography Bootcamp years ago!" Can't make it to this photography workshop? Kevin is available for one-on-one consulting. Let him know exactly what you need and he'll let you know how he can best help. Free 15-minute initial consultation when you sign up!